With the official announcement of Windows 10 editions that are going to be available when Windows 10 is officially released, Microsoft has also given more information about the specific path for Windows 7 and Windows 8.1 when upgrading to Windows 10. Windows 10 is free upgrade for qualifying Windows 7, Windows 8.1 and Windows Phone 8.1 devices for the first year after the launch of Windows 10. A blog post on Microsoft’s Australia Partner Network specified that devices that take advantage of the free upgrade to Windows 10 will continue to receive updates of Windows 10 for the life of that device through Windows Update, free of charge. 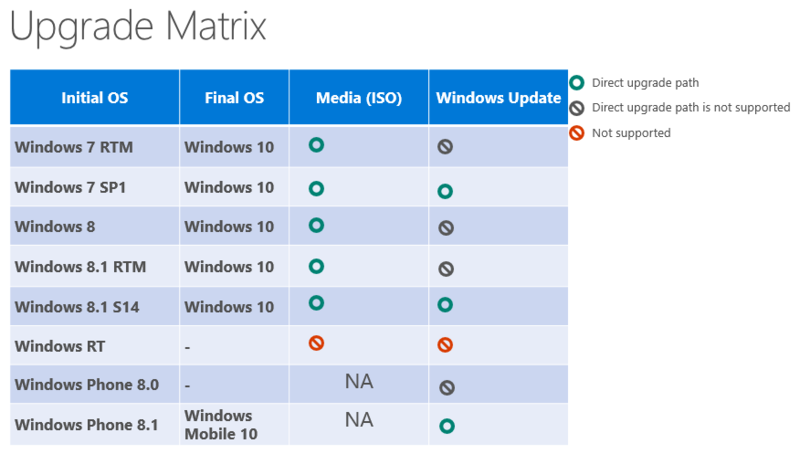 We’ve known the basic Windows 10 upgrade matrix on how the upgrade could be performed. The latest information provides details on which edition of Windows 10 you’re entitled to upgrade to. Note that Windows 7 Enterprise, Windows 8 Enterprise and Windows 8.1 Enterprise does not qualify for free upgrade to Windows 10 Enterprise, unless it’s through Volume Licensing agreement with Software Assurance subscription agreement. In addition, Windows RT devices also cannot upgrade to Windows 10, free or paid. Officially, Windows 8 cannot upgrade to Windows 10. To upgrade, Windows 8 must be upgraded to Windows 8.1, which is available for free via Windows Store, and updated to Windows 8.1 Update. Likewise for Windows 7, which must be updated to latest version, i.e SP1. The free Windows 10 upgrade is delivered through Windows Update; domain-joined machines can manually get the update via Windows Update as Windows 10 upgrade cannot be deployed through WSUS. Unlike previous Windows operating system, Windows 10 can be uninstalled, which should bring you back to original Windows OS version. Until now, Microsoft has maintained that the free upgrade to Windows 10 offer will only valid in the first year from the date Windows 10 officially available for retail. After the first year, Microsoft mentioned that upgrades will be paid via boxed product and VL upgrades. Though it’s unclear if Microsoft will stop or block Windows 10 from continue to deliver via Windows Update, or how users who need to reinstall their PC can continue to get Windows 10. Windows Vista and Windows XP users will need to pay to upgrade to Windows 10. Microsoft has not yet announced the retail price of Windows 10, but we expect it wouldn’t be too expensive to entice more to upgrade to Windows 10. Also uncertain now if Windows 7, Windows 8 and Windows 8.1 users who are entitled to free upgrade are allowed to perform clean install of Windows 10. Windows 10 is scheduled to release in summer of 2015.